Prabhas and Rana Daggubati‘s Baahubali 2 is one of the most anticipated films of 2017. And while the makers have released the first look of the film already, people are now eager to watch the trailer. 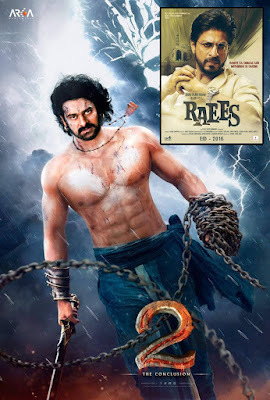 Recently there was a lot of speculation regarding Baahubali 2‘s trailer releasing along with Shah Rukh Khan‘s Raees. However let me inform this isn’t true! The makers finally put an end to the speculation and clarified that the trailer of Baahubali 2 will NOT be attached to Raees. Well, looks like all the Baahubali fans will have to wait a few more weeks to see the trailer. In fact, with the film’s shoot wrapping up just a few days back, it was obvious the makers would jump in to the post production work rather than release their trailer. There are rumours that the trailer of #Baahubali2 is attached to "Raees". We would like to clarify that these rumors are false. An official announcement regarding the date of #Baahubali2 trailer release will be made by us at an appropriate time.